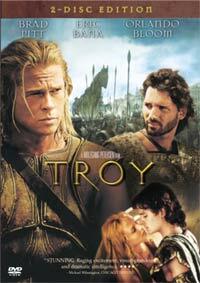 Homer's classic retelling of the Troy tale is taken on by master filmmaker Wolfgang Petersen (who gave us the likes of Das Boot and The Perfect Storm). The epic tale of lust, for both love and power, its obsession and the destruction following as result is envisioned with style and impact. Sure, there was quite a bit of poetic license at play in beefing up the viewers' emotions. The futility of the carnage of war remains a given, no matter what the reason for it breaking out. Pitt won't disappoint his fans as the undefeated warrior Achilles who becomes the instrument used to defeat the army of Troy. While lengthy, this is a highly absorbing film to be enjoyed on levels from the gigantic FX and the romantic impetus to the action and the performances.